3D Youtube videos, new way of web vieweing? 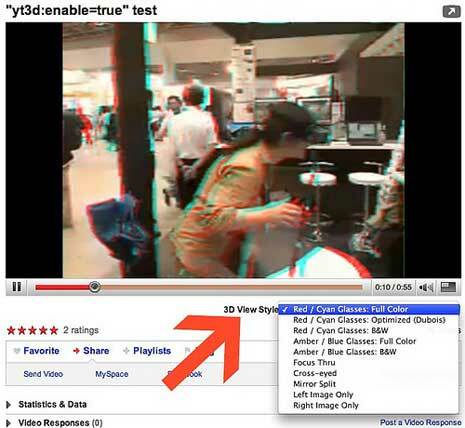 Youtube is experimenting with 3D viewing of Youtube videos. It is testing with a stereoscopic player for watching videos in 3D. Such videos have optional drop down box (see image) with number of options like: red/cyan, focus thru, cross-eyed, mirror split, left image only etc. yt3d:swap=true Swaps the left and right sources. Great work with the 3D videos on youtube but I want to report a major bug!!!!!!! If I want to see this video, on youtube site, there is no problem. I click “3D” and I choose my favorite viewing mode: magenta green, red cyan, crosseye etc. etc. But if I want to embed this video on my site I don’t have de 3D button to select the prefered viewing method, and the video is crosseye, by default, even I select on youtube the red/cyan mode! (My website is for anaglyphic content and is a major problem!) This happend on some 3D videos, not in all the cases! 1. When I customize the embed code, would better to have the option of viewing mode (red/cyan, green magenta, crosseye etc.). 2. The second and more complicate solution is the design of 3D button on the embeded players because this selector is show only when I watch a video on youtube site! I hope that Youtube solve quickly this problem!